The District have a selection of vertical banners with superior quality stands suitable for indoor use at events promoting Scouting. These are available to Groups, ESUs and ASUs free of charge. This banner specifically promotes the Beaver Section. The District have a selection of vertical banners with superior quality stands suitable for indoor use at events promoting Scouting. These are available to Groups, ESUs and ASUs free of charge. This banner specifically promotes the Cub Section. 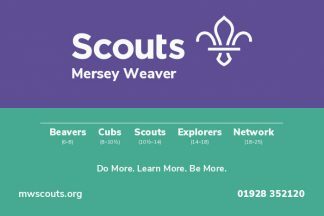 The District have a selection of vertical banners with superior quality stands suitable for indoor use at events promoting Scouting. These are available to Groups, ESUs and ASUs free of charge. The District have a selection of vertical banners with superior quality stands suitable for indoor use at events promoting Scouting. These are available to Groups, ESUs and ASUs free of charge. This banner specifically promotes Network. The District have a two vertical banners with stands suitable for use outdoors at events and things for promoting Scouting. These are available to Groups, ESUs and ASUs free of charge. One has image and text the other simply has the Mersey Weaver logo. The District have a selection of vertical banners with superior quality stands suitable for indoor use at events promoting Scouting. These are available to Groups, ESUs and ASUs free of charge. This banner specifically promotes the Scout Section.